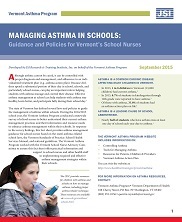 The Vermont Asthma Program (VAP), in collaboration with strategic partners, works to promote comprehensive asthma control services in Vermont and reduce the burden of asthma in the state, particularly targeting populations experiencing the greatest burden. 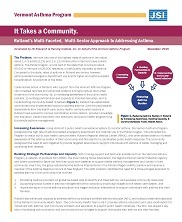 In 2014, the VAP was awarded a new five-year cooperative agreement from the Centers for Disease Control and Prevention (CDC), with a focus on expanding program functions and capacity (infrastructure strategies); expanding access to comprehensive asthma control services through home-based and school-based strategies (services strategies); and coordinating with health care organizations to improve coverage, delivery, and use of clinical and other services (health systems strategies). 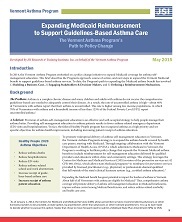 Since 2010, the Vermont Department of Health (VDH) has contracted with JSI to provide evaluation and technical assistance services to the Vermont Asthma Program, and renewed their contracted in 2015. As the evaluator for the Vermont Asthma Program, JSI uses a collaborative approach to plan and conduct program and strategy-level evaluation activities used to assess feasibility, demonstrate impact, and inform continuous program improvement. JSI also provides ongoing technical assistance to guide program planning and development.